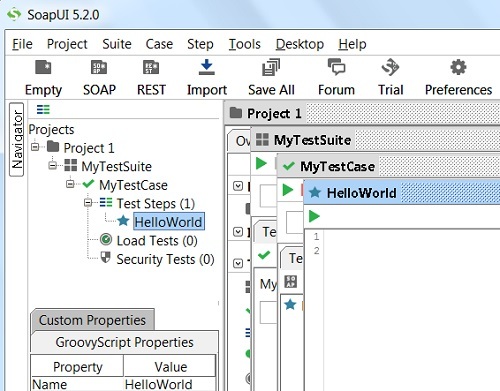 This section provides a tutorial example on how to create test projects with TestSuite, TestCase and TestSteps in SoapUI. TestStep - Represents a single unit of test activity, like running a piece of script code, sending request to obtain a Web page, making a call to a Web service, etc..
TestCase - Represents a group of TestSteps that can be sequentially executed to achieve a single test goal, like getting the current balance of your credit card, which may have 3 TestSteps: login to the Web site, get the balance and logout. TestSuite - Represents a group of TestCases that are have related test goals. Project - Represents a group of TestSuites that are related to a single project. Workspace - Represents a group of projects that should be placed together, like all projects for a single client. When you start with a new installation of SoapUI, you will have a single default empty Workspace called "Projects". 2. Right-mouse click on “Projects” and select "Create Empty Project”. You will see an empty project called "Project 1" created. 3. Right-mouse click on "Project 1" and select "New TestSuite". Then enter "MyTestSuite" as the name and click "OK". You will see an empty TestSuite called "MyTestSuite" created. 5. Right-mouse click on "MyTestSuite" and select "New TestCase". Then enter "MyTestCase" as the name and click "OK". You will see an empty TestCase called "MyTestCase" created. 5. Right-mouse click on "MyTestCase" and select "Add Step" > "Groovy Script". Then enter "HelloWorld" as the name and click "OK". You will see an empty script window called "HelloWorld" created. Very nice. Now I have my "HelloWorld" TestStep stored in "MyTestCase", which is stored in "MyTestSuite", which is stored in "Project 1" in the "Projects" workspace.